Zachary and Brandon are headed off for the first day of school. Zachary is now in 8th grade and Brandon is in 6th grade. 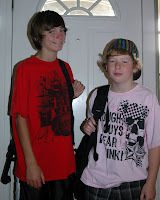 This is Brandon's first year of Middle School and Zachary's last year. Can you believe next year Zachary will be going into High School! Where does the time go? ?